Update: Want to see Tesla's self-driving tech in action? Now you can, as the car company has released a video of a Tesla driving completely on its own. The driver is there for legal purposes only, the company says, and even gets dropped off by the car at one point. The Tesla steers and stops with no human input - and brakes for a person crossing in front of it - before eventually finding a parking space and pulling in. The video gives a look at the cameras on the car so you get a sense of what it's seeing. Tesla is outfitting all its vehicles with eight cameras, plus a host of other sensors and technology needed for autonomous driving. You can watch the Tesla in action below. Though the hardware needed for full self-driving is coming to every new Tesla, the features won't be activated just yet as further calibration is needed. Tesla is bringing the hardware needed for full self-driving to its entire line, the car maker announced today. Every new Tesla the company produces from here on in, namely the Model 3, Model S and Model X, will have the equipment needed to drive autonomously. The hardware will be capable of Level 5 autonomy, CEO Elon Musk said on a call, as reported by The Verge, meaning cars can drive themselves without any input from a human driver. What kind of equipment are we talking here? For starters, eight surround cameras that scope 360-degrees at a range of up to 250 meters (820 feet). A dozen updated ultrasonic sensors are also employed, picking up "both hard and soft objects at nearly twice the distance of the prior system," Tesla said in its announcement. New Teslas will also have forward-facing radar that can see through heavy rain, fog, dust and the car in front of you, Tesla said. All the data will be processed through a new onboard computer based on a Nvidia Titan GPU that has 40 times the computing power of its predecessor. The computer runs Tesla's self-made neural net for vision, sonar and radar processing software. 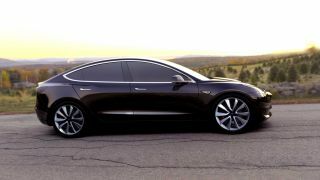 While an exciting development for Tesla and self-driving car enthusiasts, don't expect your new Model S or Model X (the Model 3 won't launch till 2018) to drive itself off the lot. Tesla isn't activating the self-driving features yet, instead holding off while further calibration based on "millions of miles of real-world driving" takes place. As that's going on, the hardware will lack some safety features that are currently available in the first-generation Autopilot, including automatic emergency breaking, collision warning, lane holding and active cruise control. Once the self-driving features are validated, Tesla will push them out over-the-air along with any new features that come along. To show autonomous driving in action, Musk said a road trip from Los Angeles to New York will take place by the end of next year. Though some question the safety of self-driving vehicles, Musk and Tesla are pushing forward with the tech, advocating that autonomous driving is safer than humans behind the wheel. Hopefully these new features roll out smoothly as we usher in a new era of getting around.